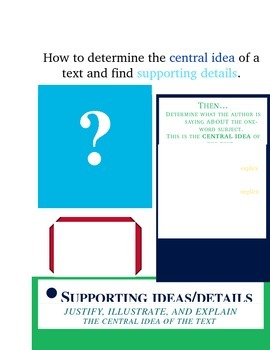 After teaching and reteaching topic, central idea, and supporting details to my struggling readers, I decided to put together a cheat sheet/poster to prompt them through their guided and independent practice. This fancy-shmancy and fun graphic breaks down topic, central idea, and supporting details. Students can monitor their learning with the embedded questions at each step. This is a fun cheat sheet that can remain on desks, in binders, or on the wall as a poster. -This document is aligned with the CCSS and uses the language of the standards. -Covers explicit and implicit central ideas (with definitions), and provides "hints" to locate implicit central idea. -This document is .docx and unlocked, so you can tweak the document to fit the needs of your students.